This section attempts to explain the exact steps for recording a login test with any publically available website which provides a reliable login page with login credentials. 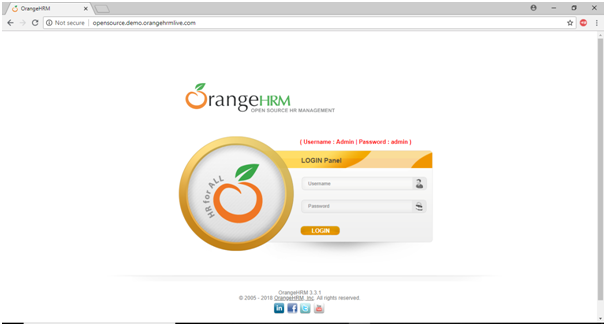 For our test purpose, we will use a publically available website provided by OrangeHRM under URL- http://opensource.demo.orangehrmlive.com to record successful login into their website. 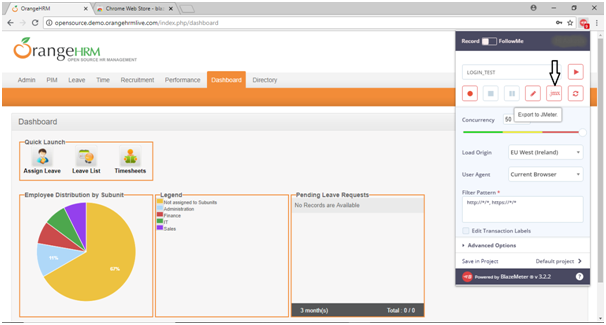 We will also use a chrome extension provided by BlazeMeter through which we can record user actions in chrome and then export the test script. 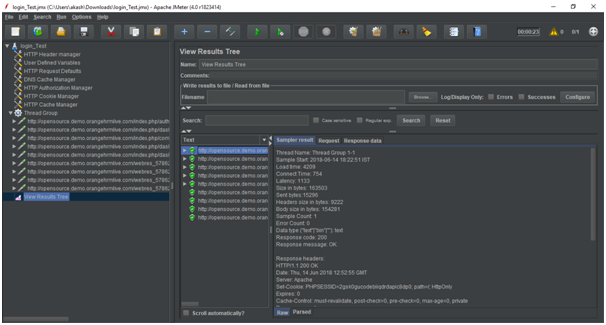 Subsequently, those scripts can be used in JMeter to run a test plan. The following image shows the login page which will be directed when we hit the above URL. 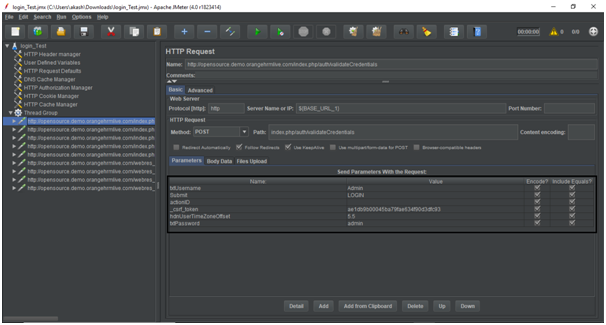 Note: BlazeMeter's Chrome extension records all of the HTTP/S requests made through the user's browser and creates a JMeter script and automatically uploads it to BlazeMeter's platform. 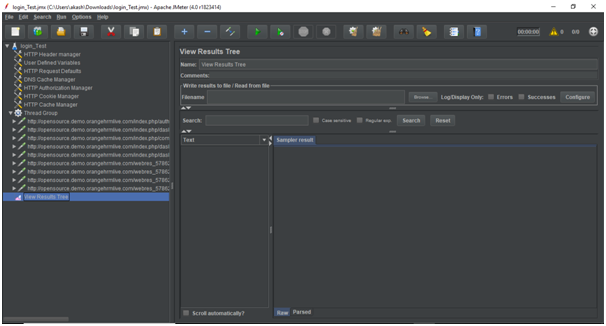 There, the script can be executed with a single click or users can opt to download the generated JMeter script (.jmx file) locally. Follow the steps given below for successful integration of BlazeMeter plug-in into your Chrome browser. Go to web store and search for BlazeMeter. CCreate account on BlazeMeter.com, their recorder is free with account creation. CYou will get a Blazemeter icon on your toolbar. CClick on that icon and it will show you the recorder toolbox. Now, we will record our testusing Blazemeter plug-in. Launch chrome and hit the OrangeHRM login page. 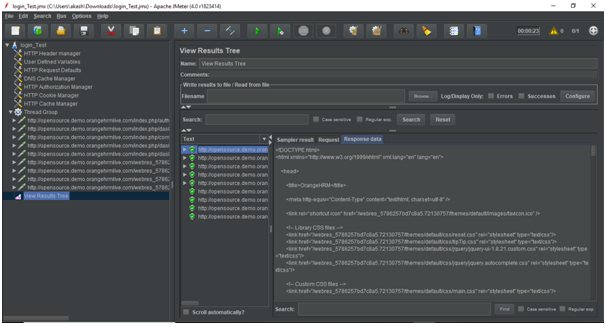 Click on the Blazemeter icon on the tool bar menu. Enter the name of the test as "LOGIN_TEST". Click on the red button to start recoding. Then, click on the login button to get logged in into the website. Once you get logged in, click on the stop recording button to stop recording actions further. Now, click on the ".jmx" button to download a .jmx file of the recorded script. 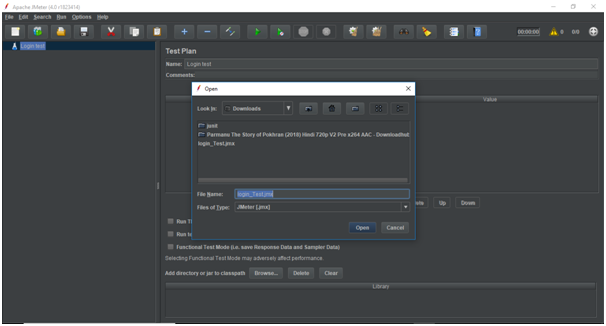 Now, we will create a test plan in JMeter and import the downloaded .jmx file in our test plan. 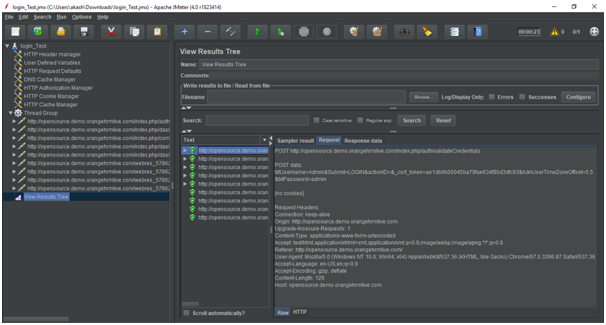 Go to your JMeterbin folder and double click on the ApacheJMeter.jar file to launch JMeter interface. Rename this test plan node as Login Test. Go to File > Open, select the downloaded login_Test.jmx file and click on Open. 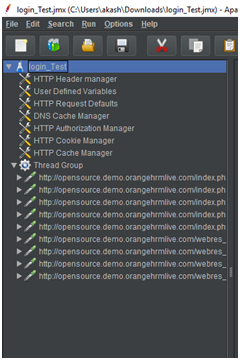 The following image shows the directory structure of the Login Test node after importing the login_Test.jmx file. 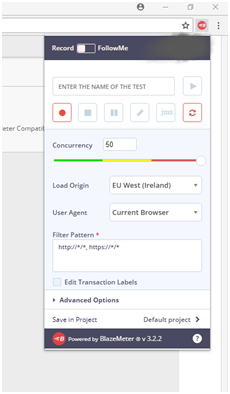 We can see that the login_Test.jmx has included all the necessary components such as Header manager, Cache Manager, samplers, etc. 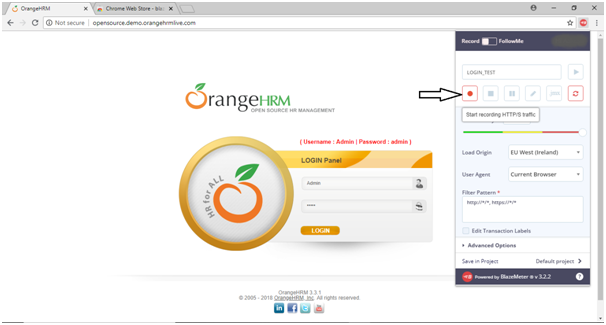 Click on the first sampler under the thread group, here you can check the login credentials which we have used to login into the OrangeHRM website. Select the login_Test plan node and right click on the selected item.